One of the longest running sagas concerning Thong Nai Pan has been the road. Until the 1980s it was nothing more than a footpath from Baan Tai to Thong Nai Pan. In the 90s it was a dirt road traversing mountainous terrain that became treacherous after heavy rain. 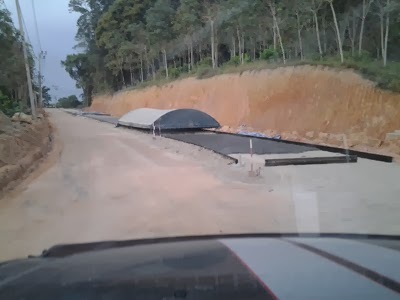 In the early noughties the big hill was paved and then in 2012 the road from Than Sadet to Thong Nai Pan was put in. Now they are working on completing the job. Work is currently underway to concrete the last section of dirt road between Jungle Flight (at the top of the big hill) and the Than Sadet turning. As can be seen from the photos the preparatory work has been done flattening the dirt. Next up is the road laying team who will lay the road in sections. 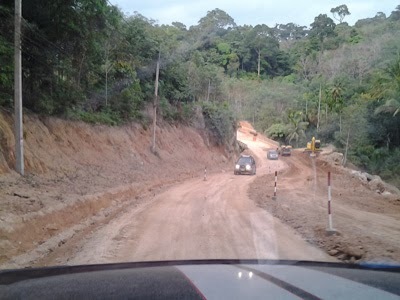 Such is the nature of road building in Koh Phangan that it seems unlikely that the road from the Baan Tai turning to Thong Nai Pan will be entirely finished but it looks like 2014 will see 90% of the road finished. The road is of a quality that exceeds any other on the island. The decision to do such a good job is no doubt down to the airport on the same road. If people are to be encouraged to fly to Koh Phangan they will want to be able to quickly get to their hotel once they land. The saga is not over, but the old fears of being stranded on the Thong Nai Pan road have become a thing of the past. There is more reason to worry about other roads on the island such as the road to Than Sadet or the big hill separating Baan Tai from Haad Rin.